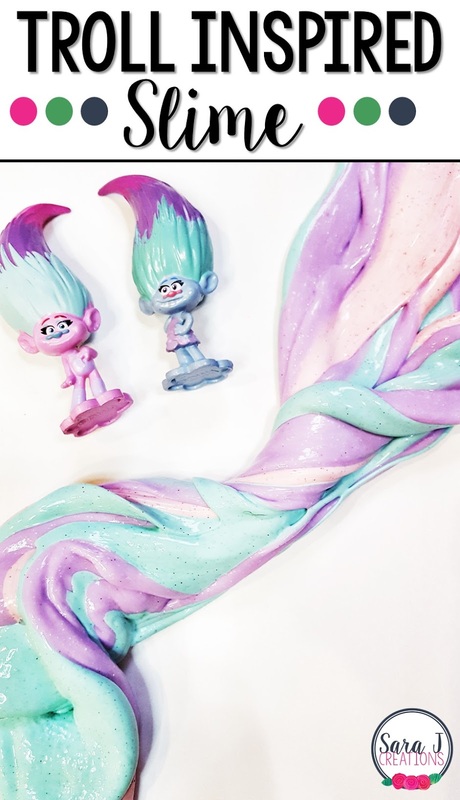 We continue to love all things Trolls around our house right now and this troll inspired slime was no exception. After my daughter's party and making "Make a Troll Kits," we are still loving and playing with troll things. The movie came out on DVD a few weeks ago which has created even more of a love since they can watch the movie over and over again and get to know the trolls by name. My oldest has fallen in love with the "twins that have the hair attached" from the movie. I think their names are Satin and Chenille. I decided to combine her love of those trolls and the love that both my girls have for sensory play. I used the colors of the trolls' hair to inspire our latest batch of slime. I have tried and loved all different recipes for slime over the past few years. This time, I started with THIS recipe from Allison at Learn - Play - Imagine. I liked this recipe because there was no exact measuring and that totally spoke to me that day. I just wanted to quickly dump everything together and have a fun and colorful activity to keep my girls entertained while I made dinner. I started with her base and then added a few other ingredients to get the right color and sparkle for our troll themed slime. This recipe is based on a 50/50 mix of glue and liquid starch so you can make your batch of slime as big or as small as you want if you keep those proportions. Mine made enough so each girl had their own small batch to play with. 1. Pour glue in the bowl and then pour in the liquid starch. Again, I didn't measure. I poured half of the bottle of glue in each bowl. Then I used the same empty bottle to quickly measure out the liquid starch. 2. Quickly add a small squirt of paint to each bowl. I used turquoise, lavender and a light pink. 3. To add a little shimmer, I dumped a small amount of fine glitter in each bowl. I didn't have purple glitter so I added white to that bowl. Because it is fine, it gives it some shimmer but you don't see big pieces of glitter. Also, just a warning, the glitter came off on my girls hands as they played and mixed the slime. It wasn't a huge deal for us and it easily came off after they washed their hands. You could easily omit glitter. 4. Once all of the ingredients were in the bowl I gave it a stir to mix the paint into the glue. 5. I kept stirring to mix up the glitter and paint as much as possible. 6. Then I switched to mixing with my hands. The slime was already starting to form and stick together. There was still a lot of liquid left at the bottom. I kept mixing and then got my girls involved so we could each hand mix a color. I was worried about whether or not the paint would stain our hands but it really didn't. We had sort of a milky substance on our hands with some color to it, but it easily came off when we washed them. So full disclosure here - I almost gave up at this point. The slime was very stringy and lumpy and wasn't blending in with the liquid in the bowl. I dumped out the liquid and had my girls keep mixing with their hands on the table to keep them entertained. At this point I went in search of a new recipe and started it (but it was an even bigger fail). I turned around and the slime the was the perfect consistency. 7. So don't give up and just keep kneading it with your hands to get it to a slime consistency. 8. I gave each girl some of each of the three colors so they could start to twist them together. The girls had so much fun even once the colors were blended together. They got out their Trolls characters and played with them in the slime for almost an hour and then play with it again the next day.